We can't wait to meet with you and discuss the vision for your event. Please take a moment to provide us with some important details. Tell us about your event! Is it a Wedding? Corporate Event? Party? Fundraiser? Please provide the physical address of ceremony or event venue. Please provide name of reception venue, if separate from ceremony venue. Do you have certain colors in mind for the event? Who is your wedding/event planner? What else do you think we need to know? Thank you for contacting In Bloom Florist for your special Event. If you would like to send inspiration pictures please email them to events@inbloomflorist.com. We will respond within 24 to 48 hours. If you need immediate assistance please call 407-649-7771. Thanks to our grower-direct product line and talented team of coordinators and designers, we craft swoon-worthy events that surpass even your most favorited Pins and vision boards. Have a picture of something you like? We are also happy to emulate your selections to achieve exactly what you have in mind. We believe the best flowers are those "closest to the dirt." We work directly with growers to source the most fresh, unique and high-quality florals for your event. When you picture your big event, Imagine it In Bloom! With a heightened aesthetic only our team of visionary designers can craft. Modern arrangements set the scene for an industrial Orlando rooftop wedding. Burgundy blooms and bohemian themes have been a strong trend that we can’t get enough of! 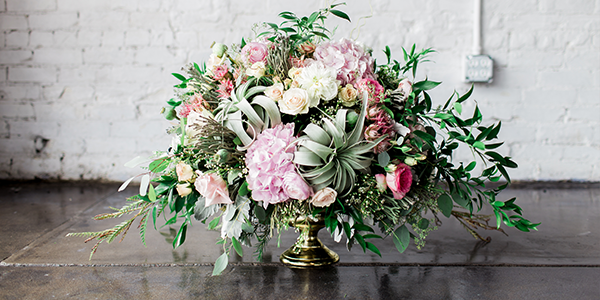 Greenery-focused arrangements make for a simply elegant look. We work 'hands-on' and direct with growers to ensure the most unique selections and longer lasting products. Our team of creatives will design, construct and refine your dream look- and lead you every step of the way. When the big day comes, we make it a habit to exceed expectations, with installments and details to elevate your event. Book a complimentary consultation with us today to get started on your floral vision. I loved the fact that at our 30 day meeting they had created one of our centerpieces for us to see. I even got a text the morning of the wedding of a pic of the bouquets that were on their way. The bouquets, bouteniers, corsages, centerpieces, archway pieces, and flowers on the cake were everything I dreamed of. If we could rate them higher than 5, we would. We were SO IN LOVE with our flowers. So many guests told me afterwords how lovely our flower arrangements were. In Bloom worked with us throughout the planning to make sure that we were 100% happy. The customer service is outstanding, their team is very friendly and always helpful. If we could rate them higher than 5, we would. In Bloom did an outstanding job of providing beautiful bouquets and flowers for the wedding ceremony and reception. The flowers were fresh and delivered on time. This is the second wedding we have chosen In Bloom and they were exceptional again. I would highly recommend In Bloom Florist for any occasion. Our wedding was handled with the utmost professionalism and kindness from our first meeting to the day of delivery. No one could stop talking about how beautiful the flowers were. Words cannot express how great In Bloom is! Amanda is simply the best in terms of helping to coordinate your vision and make sure everything runs smoothly the day-of. Everyone was so friendly at their actual store and Amanda gave us a walk through after discussing our ideas to show us various products and flowers available. In Bloom pretty much saved my wedding day! Their first mock up was exactly what I had in my head! I don't know how they did it but their artists are so talented. I had somehow approved the wrong number of bridesmaid's bouquets and my mom caught my mistake the morning of the wedding. In Bloom was able to take what they had on site and make enough bouquets for the rest of my bridesmaids!